Fintry Brewing Company (FBC) was established in 2012 as an initiative by four members of the Fintry community, each with a very different background, but all sharing a passion for beer. Put together a Scientist, a Medic, a Musician and a Chef and you have a brewery. 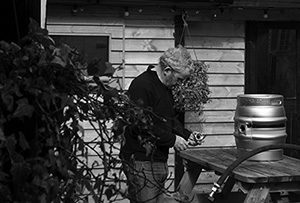 We create high quality real ales that are inspired by the local terrain and have taken our inspiration from the surrounding countryside and its ancient history. All our ales are named after local landmarks with the character of the beer reflecting the unique heritage of each location. We have chosen the hare to represent our beers as the animal carries a potent symbolism both in Celtic and other global mythologies. The hare has long been associated with the Moon and mystery – it is also associated with renewal, creativity and even bouts of creative madness! In Europe the character of the hare in mythology is even more complex, being symbolic of inventiveness and unpredictability; something which we hope our beers reflect. All in all, these delightful animals that live around us in the hills and fields of Fintry are an inspiration; so an ideal icon for our aspirations.